Basing it off of Lynn Staheli's "Fundamentals Of Pediatric Orthopaedics" and with the assistance of the staff of the Rambam Medical Center, Drs. 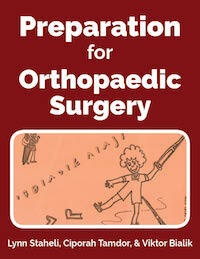 Ciporah Tadmor and Viktor Bialik shepherded this charming, children and family friendly coloring book to help with patients' understanding of the experience of orthopaedic surgery. Along with the main authors, the coloring book would not have been possible without the help of Efrat Abraham, Suzie Lubenheim, Rana Hoffman, Lina Lavie, Margalit Basch, Peretz Lavie, Gadi Bialik. Arabic translation by Riad Dakwar.